Stereohype’s fifth, and debut full-length, studio album, More Than Motion, is loaded with hits. The title track, More Than Motion, as well as Loco Motive and No Heroes can be heard on the band’s MySpace page. Other tracks include Blackout, The One, Times Like These, and Stockholm. 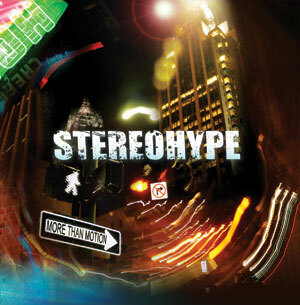 In the past one of Stereohype’s hits was a drinking song and they didn’t let us down with this new album. More Than Motion is filled with drinking songs and references. If you have ever had a few too many drinks and found love in a bar Blackout is the song for you; and if you haven’t, its catchy chorus is still a lot of fun to sing along to. The One starts off with very popular rock runs and then falls into full-on trumpets. No album is complete without at least one broken-hearted song, and although there are multiple on this album, The One will most definitely be a favorite with its “emo” lyrics, heavy rock drums and even a screamo line made original with the bands signature ska flair pumping the chorus. Given that Stereohype’s genre is ska expect to hear various musical stylings intertwined throughout their songs. Times Like These starts off very reggae with blues overtones, but proves itself rock before the theatrical rap mid way through the song. Showing the guy’s humor, Stockholm’s clever lyrics are a prime example of the cliché that a guitarist’s axe is his girl. Chase Thomes vocals, mixed with the guitars, drums and horn line, showcase a jazzy funk style that only a southern-bred band could pull off appropriately. Every song on this album is high voltage, demanding you to get up and dance (or skank in ska terms). No matter the situation, More Than Motion has you covered; after listening to a song or two you’ll be driven to get out there and live life to your fullest. Despite your preferred genre or Stereohype’s unsigned status, this album is a must listen for 2009. The album’s May ninth release date, however, is now uncertain. A car ran a red light and struck guitarist, trumpet player and vocalist Nicholas Rohde on his motorcycle after the band’s victorious participation in a battle of the bands at the Hard Rock Casino. Rohde is in good spirits. While having sustained serious injuries that may inhibit his ability to play and perform, he was wearing a helmet and padded riding jacket that may have helped save his life. Hopefully, he will make a full recovery and can return to what he does so well–making great music. The driver who struck Rohde was uninsured, leaving Rohde with the burden of medical expenses, etc. If you are interested in donating to the Nic Rohde benefit you can either go in person to Hancock Bank and make a deposit to the credit of: BENEFIT FOR NICHOLAS ROHDE 044288920 or attend the benefit show at Nate’s Sports Bar and Grill on May 8th. Thank you for the review ans actually we have good news! We will be performing all of our cd releases, May 10 at the hard rock is still on, I just cannot perform so we have someone learning my parts!